If you've reached this stage because you've had difficulty using Geckoboard, drop our friendly support team a line and we'll be happy to help! We know that sometimes things just don’t work out. If you need to cancel your Geckoboard account, you can do so at anytime from your Account settings. This will delete all your settings, dashboards, and data and cancel your subscription immediately. If you need to preserve your dashboards for future use, please get in touch. Log in to your Geckoboard account. Click on your initials in the top right hand corner. From the drop-down, select Account (if you're logged in already, simply click here). 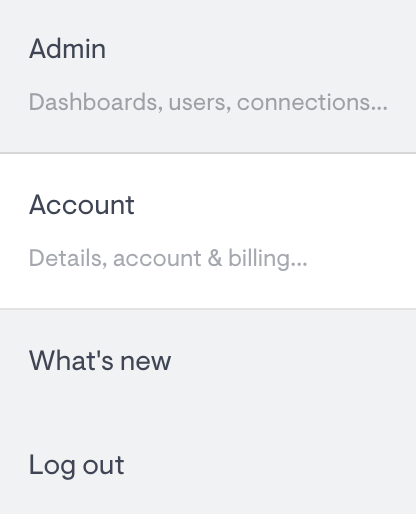 You'll land on the Account details tab by default. Scroll down to the Cancellation section.